Biofuels can be made from just about anything living, so there are a lot of exciting options for those looking to change how future cars are powered. For a team of students and professors at Utah State University, the best way to get their vehicle on the road was using waste materials produced by some nearby cheese factories. 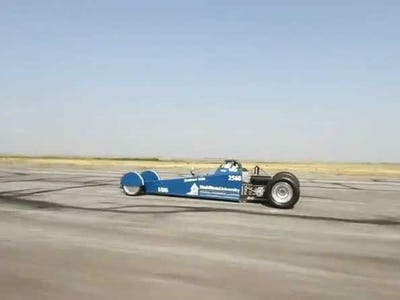 At the Bonneville Salt Flats this month, a dragster powered by the cheese fuel became the fastest ever vehicle in its class using 100 percent biofuel, hitting 64.37 mph. The idea was born out of a project by the University's College of Engineering and College of Science to create a yeast or bacteria fuel platform utilizing "waste carbon." Unlike fossil fuels, biofuels are not a limited resource. They are more energy-dense than electric batteries, and can be used in many existing vehicles. Dr. Brad Wahlen, who worked on the project, explains that there are many cheese processing plants in the region. Among the by-products of their operation is a solution that is protein- and fat-free, and rich in lactose sugar. That combination made it a good fit for the project, and the team thought, "We can take this and turn it into a fuel." The use of "waste carbon" addresses a major criticism leveled against biodiesel: that the creation of cropland to grow the raw materials for biofuel produces significant carbon emissions. It also avoids using crops that could be eaten, and takes advantage of a material that previously had no purpose. The team began building the car in early July, pairing chemists, unaccustomed to working on large-scale projects, with engineers, charged with building a car that would maximize the potential of the unusual fuel. With an ey! e to the future, Wahlen calls this manifestation of the technology "just the beginning platform." It is a model that can be adapted to make fuel from any product that contains sugars. Next year, the team will work with algae and bacteria biofuels.The engineers will continue to improve the dragster itself, to push the speed limit higher. As for the future of cheese-powered cars, they could play a role in the future of transportation, but not a starring one. According the Wahlen, enough of the waste solution is generated to produce 66,000 tons of fuel every day, but that comes nowhere near matching nationwide demand. The speed record of 64 mph leaves a lot to be desired, but this was a short-term project that turned the scientific equivalent of dumpster diving into a new record. Non-fossil fuels are a viable solution to the looming problems of peak oil and climate change, if innovative thinkers are willing to make them work.